Dinosaurs make an appearance in cameo contest top ten: Congrats to SammyK! SammyK does it again! Our all-time Spoonflower champ comes out on top in yet another contest by virtue of her astonishing, untiringly creative (and funny) approach to the Fabric of the Week themes. With "Reallllly Old Cameos" she marries the concept of cameo-inspired designs to an unexpected partner, dinosaurs, to win the most votes in a field of terrific fabrics. As those of you who follow our blog may already know, Samarra's new fabric collection for Timeless Treasures also had its debut at Quilt Market this week in Houston. SammyK is on a roll! [Read more…] about Dinosaurs make an appearance in cameo contest top ten: Congrats to SammyK! The winner of our autumn-themed Fabric Of the Week contest — in which designers were allowed to use no more than three colors and white — is none other than Dennis Bennett, or dennisthebadger, a doctor from Frankfurt, Germany, who happens to dabble in fabric design. Dennis has won two previous contests, including the contest sponsored by the folks at NAP, the maker of Boba baby carriers. What's more, this makes the second week in row that a male designer has won our Fabric Of the Week contest. That's certainly never happened before, but perhaps it's a trend. Be sure to check out the top ten designs from the contest this week and if anyone decides to make an autumn-themed quilt from the winners, please, please, please post a photo in the Flickr group! Check out the winner and top ten from this week’s bird fabric contest. With 342 entrants in our palette-limited contest for bird-themed fabrics, winning is no small accomplishment. So special congratulations go out to first time contest winner Jacob Billings, a designer in Independence, Missouri. He and his wife also happen to be, he tells me, awaiting the arrival of their first child any time, so this is just one more (comparatively small) bit of good news. Woo-hoo! Be sure to take a few minutes to admire the top ten from this week's competition. They are fabulous! [Read more…] about Check out the winner and top ten from this week’s bird fabric contest. Continuing with our tradition of holding the occasional sports-themed design competition (fishing fabric, anyone? ), this week's bowling contest offered a tournament's worth of fabulous fabrics. The winner — by a healthy margin — was Jennifer Wambach, a New York artist who has now won four Fabric Of the Week competitions (Hawaiian cheater quilt, alphabet, pointillism), which puts her in a very elite group of designers in our community. Congratulations, Jennifer! The top ten bowling designs all look amazing, of course. On a personal note, I much prefer bowling to golf because it's much harder to lose the ball. [Read more…] about Bowlerific Top Ten: Are these contest-winning bowling fabrics up your alley? A Kawaii Kitchen Full Of Cuteness: Bora wins the contest for plushie patterns! [Read more…] about A Kawaii Kitchen Full Of Cuteness: Bora wins the contest for plushie patterns! In all the excitement over Free Swatch Day, let's not lose sight of the terrific top ten from the circus-themed Fabric Of the Week contest we just finished. This week's winner is Cody Scarborough of Brooklyn, New York, whose marching elephants carried the day in a competition full of lovely, quirky fabrics. Way to go, Cody! You can now purchase any of the top ten fabrics from this week's contest, which are accessible via the convenient link below. Announcing the gentle winner of our shark fabric contest! While sharks elsewhere may be full of menace, our contest winner this week is well suited to the gentle medium of fabric. The winning design from our shark competition is "Deep Sea Beauty Contest" by Kayajoy, which makes the third win by designer Tamara Serrao of Montreal. Her previous wins came in the Imaginary Animals (which was actually a tie) and Rain contests. Lovely work, Tamara! [Read more…] about Announcing the gentle winner of our shark fabric contest! 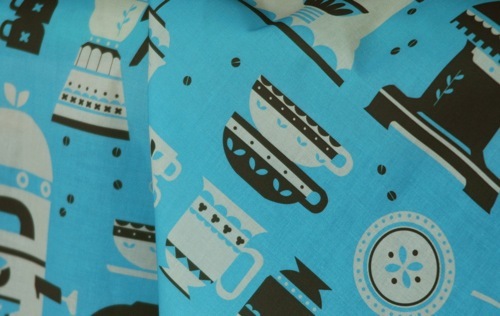 Serial designers win coffee fabric contest! This week's contest winner TheBoerWar is actually a married couple in Toronto who decided to make 2011 the year they undertook the challenge of creating a new fabric design for every single Spoonflower Fabric Of the Week contest. You remember that we do these every week, right? So it really is a special pleasure to be able to announce that TheBoerWar's efforts have paid off in the form of a win in our coffee-themed design contest, which was full of brilliant work. So you can have one more coffee fabric for the road, or you can check out the top ten, all of which are now available for sale! [Read more…] about Serial designers win coffee fabric contest!